5. Frequently check and adjust the air cylinder, butterfly valve and electromagnetic gas valve in order to make the close and open of these components conform to the requirements. 6. Frequently check every system and if there are the phenomena of ash leakage, air leakage, oil leakage and electric leakage, deal with them in time. 7. Clean the diesel engine concrete mixer and the discharging hopper of diesel engine concrete mixer every four hours to prevent residual concrete from freezing which can affect the normal operation. 8. It is necessary to release the accumulated water in air compressor, air tank and filter and the failures per shift and eliminate all faults in the process of operation. 9. Maintain the butterfly valve, concrete mixer, electromagnetic gas valve, air filter and atomized lubricator according to the requirements of the relevant instruction book. For more information about concrete mixers, please feel free to contact Zhengzhou CamelWay Machinery via email or at the contact addresses available on this website. 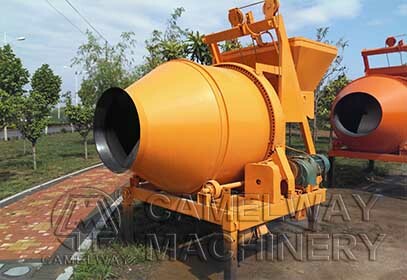 The Concrete Mixer and Concrete Mortar Mixer is the Same?